January 8, 2014 / P.J. (Editor’s note: Andrew has been submitting stories for several months and we’ve been spacing them out. Therefore, this story was written before the Korean National tournament). September 28 and 29 are the two biggest disc golf days in South Korea. Why? Because it’s the 6th Annual Korean National Disc Golf Championships, of course! I, for one, can’t wait to compete in my first PDGA-sanctioned tournament on foreign soil. Though it is only a C-Tier, it promises to have all the thrills and excitement of an A-Tier or even a Major, just because of the pride and dedication KPDGA puts into this event. Despite being rated at a paltry 845, I will be competing in the intermediate division. Other Americans have given me a bit of guff over this, thinking I should be playing even higher, but playing two divisions higher than my rating allows seems enough for this humble disc golfer. The course for nationals will be a temporary course set up on the grounds of the Korean National Youth Center, right in the heart of Seoul. 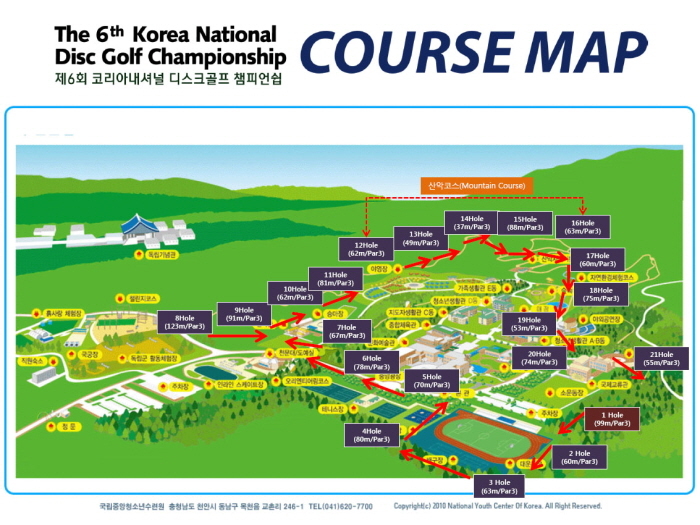 As is appropriate for most Korean courses (save, of course, The Dragon’s Lair with our awesome 600-foot hole), the course is set up to be short and very technical. There is also a strangely disproportionate amount of right-finishing holes. Nevertheless, it promises to be a good, yet demanding, time. There will be many Americans competing, but the only other American from my neck of the woods will be Joe, who will be entering his first tournament (he’ll be playing in the recreational division). As this is a fairly short course, I had to change up my bag a little bit. Hole 8 is the longest hole, at about 370 feet. I always feel a smidgen more comfortable with my distance drivers in the bag, though this time I’m sure I won’t need them. Still, I carry a massive amount of discs in my Physical Flight Contender. What can I say? Like Dave Feldberg, I like to have a lot of options. Now, I know and am comfortable with all of these discs, which works to my benefit. With the experience gleaned in my multiple decades of playing, it really only takes me about three rounds to get really comfortable with a disc (not to say I’m any good with them, but that’s beside the point). As mentioned in a previous column, I am also a reviewer for Infinite Discs, which allows me access to all the new stuff and, one could surmise, a bit of an advantage over the competition. In my mind, at least. However, going into this tournament I also realize that winning, or even placing well, will be no cakewalk. I’ll have to be precise and deliberate with every shot, as short, technical holes leave very little room for error. I don’t want to just show up and arrogantly think I can win. I need to beat this course into utter submission. So for the next two weeks, I’ll be rising early (well, even earlier than normal) and will just focus on putting for an hour straight with the Innova Skillshot I have in my room. I have a stack of Wizards for this, and I’ll be just banging putt after putt until I am making 100 percent of my putts from my entry door to the basket (which happens to be 28 feet and 6 inches). I’m already pretty decent at that distance, but inside the circle has to be the “all the time, every time” putts. I can’t afford even one blown putt if I want to take the championship trophy home with me. The next step is to just play as many holes as I can. This is clearly the most crucial element. I won’t need any long, bombing drives, so there is really no reason to put in any field work, especially with my time limited as it is. The layout for Korean Nationals. Luckily, I happen to have a course right out my back door, so on those long days when I don’t get off until 6 or 7 at night, I can still manage to play a few holes. I’ve also designated certain “must-play” holes, and others “fun” holes. The must-play holes are the shorter, technical Dragon’s Lair shots like 1, 2, 3, 6 and 8. These are the holes that I make sure to play on every round, no matter how crunched for time. The other holes are really fun and, of course, challenging, but also have little pertinence in regards to the shots I’ll be facing at Nationals. Considering the rather, shall we say, unique, layout of the Dragon’s Lair, skipping a few of the fun holes is no problem whatsoever. I’ve played quite a few tourneys in my day, and even prepared and trained for a handful (none of which I have won, for the record), but putting in maximum effort and focus like this is a rather new experience for me. I’m gearing up for Korean Nationals the same way others might gear up for Worlds or USDGC. I am wholly focused on my goal of being the top Intermediate player in South Korea. When you factor in how long I’ve been playing this sport, the fact that I am not only competing in Intermediate, but giving it my all to win said division, could be seen as either sad or truly dedicated. I would prefer dedicated, but I’ll let you, gentle reader, form your own opinions. Regardless of the outcome, I’m looking forward to playing a new course and meeting a whole new group of people. Luckily, disc golf in Korea – as it is in America – is nice and laid back, so the fun factor will be high. My next column will fill you in on all the details of the 6th Annual Korean National Championships, and hopefully report on my big win! 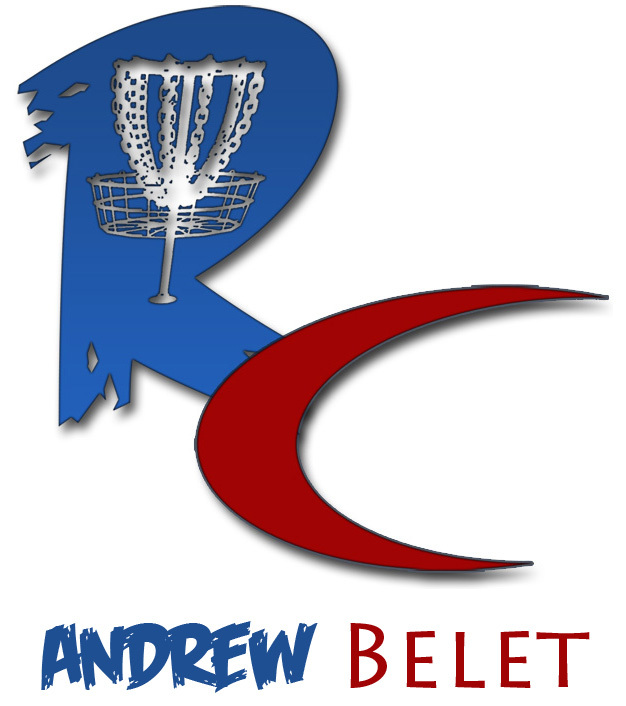 Andrew Belet has been playing disc golf for more than 20 years. He’s currently serving with the U.S. Army in South Korea. A published author and poet, you can see his works on Amazon. He can be e-mailed at andrew@rattlingchains.com.